Free diving is an aquatic activity in which you hold your breath while diving under water. It uses the human body’s ability to lower its pulse and shrink blood vessels to endure high pressure and no oxygen while diving without an oxygen tank. Free diving can be dangerous, posing health hazards for your heart, lungs and body. However, performing breathing exercises for free diving can help your lungs become conditioned to the physical demands required. Perform aerobic exercise two to three times per week to help increase your lung capacity. During aerobic exercise, your small blood vessels widen to deliver more oxygen and reduce carbon dioxide buildup. The more aerobic exercise you do, the better your body will become at holding your breath for longer. Perform Pranayama Yoga to increase lung capacity by improving the flexibility of your rib cage and allow your lungs to fully expand. According to “Yoga Journal,” this type of breathing exercise boosts lung capacity by strengthening your diaphragm. Condition and stretch your lungs by performing the lung stretch exercise. Inhale deeply, filling your upper and lower chest to capacity, then exhale forcefully to eliminate all air in your lungs. Warm up your body and your lungs by inhaling deeply, holding your breath at the top of the breath, then exhaling over a five-second time period. Repeat five or six times to finish your warm-up. Inhale deeply a few times, then hold your breath for one minute. Walk slowly as far as you can before taking a breath. This allows you to record how far you can go before taking a breath. Practice deep breathing exercises to increase your lung capacity and learn how to reduce your heart rate so your body consumes less oxygen. Place your hands on your stomach and exhale completely out of your mouth. Inhale deeply through your nose, pushing your hands out with your stomach. Now, hold your breath for five seconds, increasing each time you do this exercise. Slowly release the air through your mouth. Perform breathing exercises for free diving daily in order to increase your lung capacity and enable you to dive for longer. 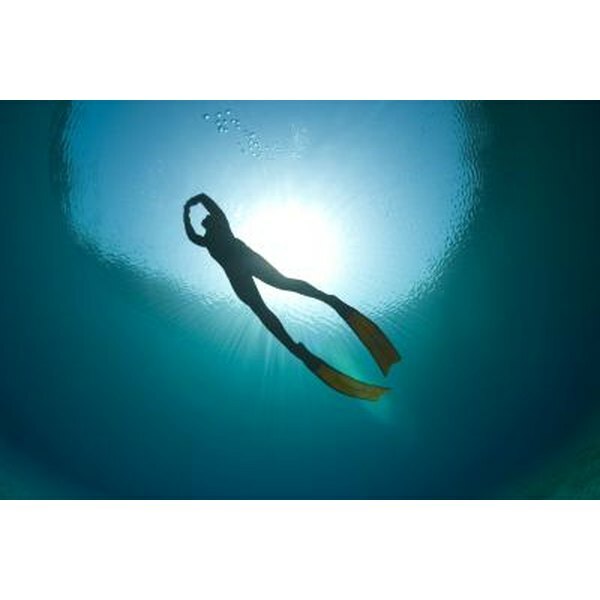 Free diving poses health risks for your heart, lungs and body due to the intense water pressure and length of time your body goes without oxygen, so speak with a doctor before beginning free diving. “Yoga Journal”: Is Yoga Enough to Keep You Fit?